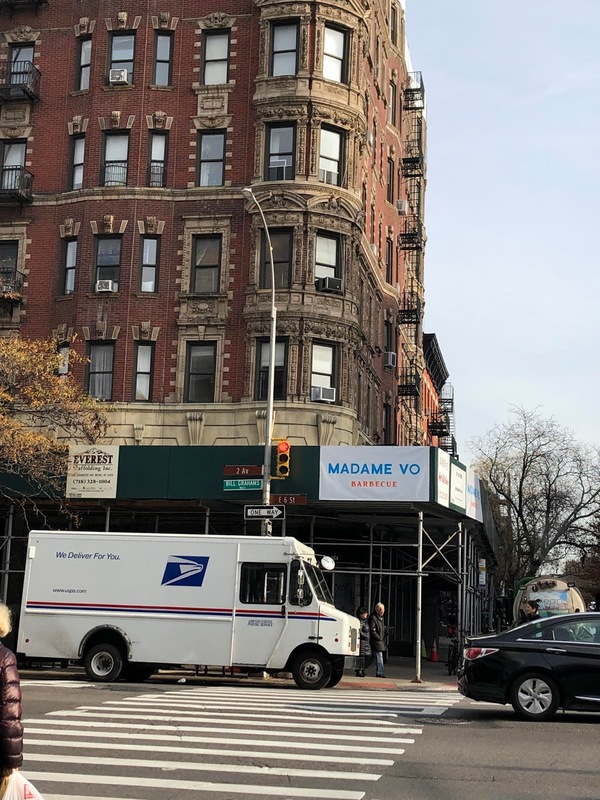 The sidewalk bridge signage has arrived for the incoming Madame Vo Barbecue, coming to this northeast corner of Second Avenue and Sixth Street — officially 104 Second Ave.
As Eater reported back in July, the owners of Madame Vo at 212 E. 10th St. between First Avenue and Second Avenue are opening the sister restaurant specializing in Vietnamese barbecue. The Madame Vo team was OK'd for a new beer-wine license back in September. This barbecue offshoot will have tabletop grills for meat and seafood in various marinades including curry, lemongrass garlic, and honey fish sauce. It’s typically a celebratory food in Vietnam, and here, the barbecued proteins then go into customizable summer rolls. No. 104 previously housed several forgettable concepts, such as Wall 88. Previously, the address was the Lions BeerStore — part retail shop, part restaurant, all BeerStore! — for 16 months.